The creative solution to the global challenge disrespect manifests across all cultures resulted from years of study, observation, experience, and analysis, plus the heart-breaking responses to reading, watching, and listening to the news of what we do to each other … every day … in small ways to huge ways. We never know where disrespectful acts born of broken spirits, prejudice, ignorance, revenge, and hate are going to arise. We cannot lock down the whole world. We are not safe anywhere. We cannot police the whole world, nor should we. Freedom is key to all of us developing our potential to the best of our ability … for our own satisfaction, but also because being our best unique selves also makes us the best parents, teachers, employers, employees, entrepreneurs, leaders, and citizens of our country, plus our global community. The ultimate weapon is not one of force, but is logical, practical, and compassionate … the adoption of a global principle recognizing each life as valuable … to be respected … simply for being a life. Yes, love is the ultimate goal, but as the statistics and news show, there is much work to be done before we even value … respect everyone. The key to acceptance of respect as a global principle is to realize valuing … respecting people means we have to give up judging, having to like or approve someone or a group of people. 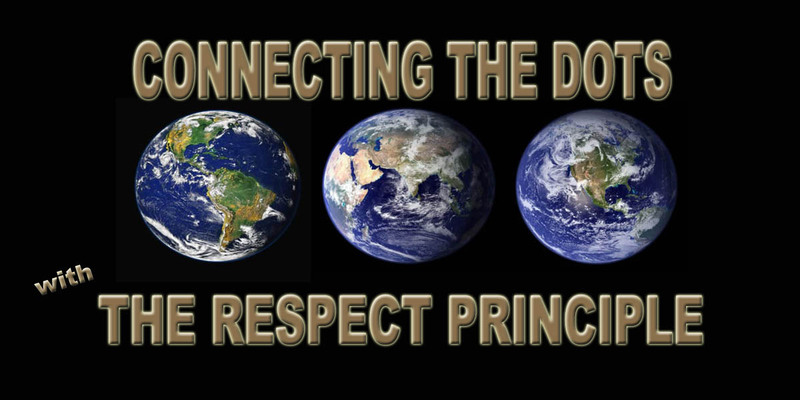 Connecting The Dots With The Respect Principle is a “live and let live” mentality that ultimately fosters peace and the evolution of humanity to a new level of existence. Of course, when others intend or do harm to others, we are also mandated to stop such disrespectful acts. Stay tuned for the play, Charles’ Choice, designed to introduce the Connecting The Dots With The Respect Principle idea to schools, communities, and organizations this September! Thank you for your interest in making our world a better place … perhaps even for being a supporter! This entry was tagged Compassionate Purpose, Creative Solution, Giobal Initiative, Intellectual Deduction, Stay Tuned for ..., Ultimate Goal. Bookmark the permalink.